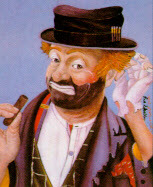 Freddie the Freeloader character famous on his television show then after his retirement he spent his time painting. This is one of his paintings. They can sell for thousands of dollars. Red spent his early years in vaudeville, Broadway and radio. He also appeared in more than 30 films. In 1951 CBS hired Skelton to star in his own variety show where he made famous characters such as Freddie the Freeloader and Gertrude & Heathcliff. Red ended each show with the phrase "Good night and may God bless". 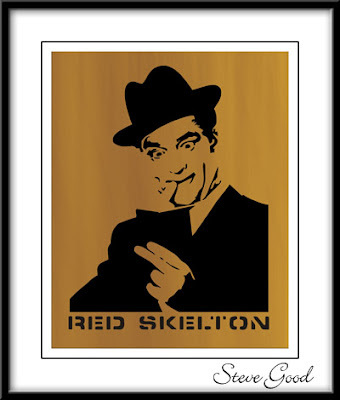 The world lost Red Skelton in 1997 at the age of 84. Now for your listening pleasure "A Christmas Story" staring Red Skelton. If you are looking for some simple patterns to use up that scrap wood in your shop this pattern book might help. There are more than twenty patterns in this book. All the patterns are quite simple and would be easy patterns for young scrollers to learn with. The hardware is inexpensive and can be found at most hardware stores. 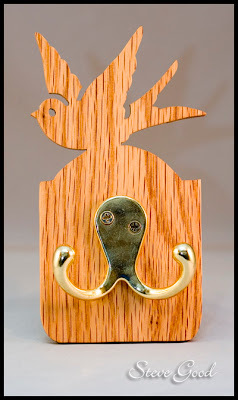 Use the hanger as a template for drilling the holes in the plaque. You can then use the screws that come with the hardware to mount the plaque to the wall. Lydia, a reader of the Scrollsaw Workshop has been working on her pattern design skills in Corel Draw. She has generously contributed a pattern to our readers. Lydia, I know you have been working through some of the video tutorials. You are making great progress. 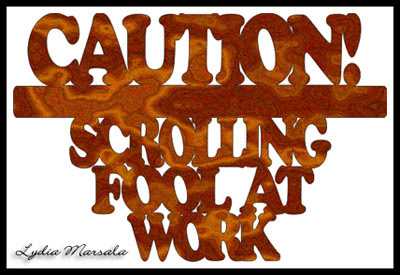 One word of caution though. Designing patterns may be addictive. Watch for the symptoms. Forgetting to go to bed, consuming large quantities of Pepsi and worst of all, explaining to friends what a bezier curve is. Thanks again Lydia. Keep up the great work and I'll be happy to post any pattern you would like to share with us.